This initiative is in perfect harmony with our efforts in promoting the fight to end TB in our respective countries. Establishing the first ever MENA coalition to end TB, these organizations are committed to act together to foster the national efforts and programs that will tackle the TB epidemics in the region. Register and become a member of the Coalition and join a vibrant community of leaders and advocates to end TB in the MENA Region. Thank you for submitting your request. We will contact you soon by email. The launch of the MENA coalition is the aftermath of collaboration between the Tunisian Center for Public Health (TNCPH) and the International Treatment Preparedness Coalition in Middle East and North Africa (ITPC-MENA) to support Stop TB Partnership to ensure a meaningful civil society participation to the first MENA Zone Tuberculosis (TB) meeting co-organised by the international Red Cross and Red Crescent Societies and hosted by the Egyptian Red Cross, May 8-10, 2018 in Cairo, Egypt. This meeting brought together HIV and Human Rights advocates and other civil society groups working in the fight against TB from Egypt, Tunisia, Algeria, Morocco, Mauritania, Sudan, Bahrain and Lebanon. 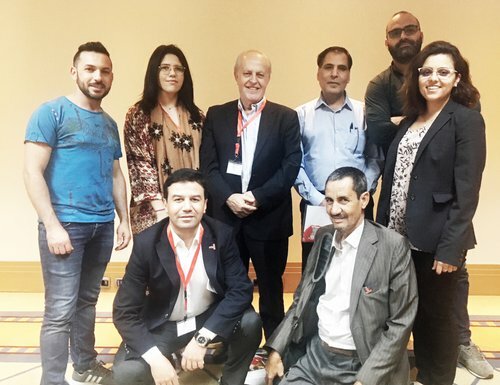 The above mentioned organizations declare the establishment of the first TB MENA Coalition to develop a coordinated regional TB advocacy plan that aims to push the different stakeholders including governments to give the TB epidemic the deserved political attention. In the light of principles of human rights, social justice, public health, and sustainable development, it is paramount to raise TB to a higher political concern in the region’s development and political agenda. more effective TB and HIV responses integration. Promote a people-centered approach, complementary approach to the prevailing biomedical programs. Support TB communities and TB-survivors to become an active part of the response to end TB and promote gender equity and key populations inclusion. Improve access to treatment and diagnosis and to psychosocial support; including in emergency situations for internally displaced people and refugees. Accelerate development tools to end TB such as vaccine, diagnosis, and introduce new treatments to reduce treatment period, treatment side-effects and combat anti-resistant TB. The majority of new cases of transmission of TB in the Middle East, occur within migrants groups such as expatriates workers or refugees. It is therefore paramount to include migrant populations in interventions.